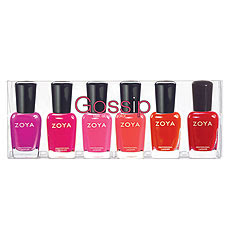 The Beauty of Life: Zoya Gossip Collection Giveaway: Winner Announced! Zoya Gossip Collection Giveaway: Winner Announced! Congratulations to Miss Judy Maltz! She was picked at random out of 683 entries to win the Zoya Gossip Collection Giveaway. Judy will be receiving the six polishes from this past summer's hit collection, inspired by the gals from hit TV show The Hills. Thanks to everyone who entered, and stay tuned for more fabulous giveaways at The Beauty of Life!